I don`t write about my native Canada very much, but the last few weeks of December is usually a time for getting together with friends and financial professionals. During such occasions, the discussion often turn to the markets. The question is not a surprising one given how profitable our banks are, what a powerful presence they have in our economy and how well their stocks have done. And it’s timely given questions about the impact a toppy housing market and troubled energy sector will have on the banks’ future. In his piece, however, John suggests that an all-bank portfolio is not a good idea. I concur. The Big 5 in Canada all have slightly different strategies, but they’re still tightly linked to the same economic factors: jobs, debt levels, commodity prices and the housing market. They will react similarly at times of stress. From a big picture macro perspective, I would tend to agree. As the black line in the chart below shows, the Canadian financial sector has been beating the TSX Composite for about three years. However, there are a number of ominous signs suggesting that era of superior returns may be coming to an end. In the above chart, I show a couple of other factors that are correlated with the relative market performance of financials. Credit, as measured by the relative price performance of Canadian corporate bonds (shown in blue), has been on an upswing - until recently. The recent negative performance of credit will likely create stresses in the banking system. As well, we have seen the value/growth cycle in Canada (in purple) correlate well with the relative performance of financials. In 2014, value has rolled over against growth, which is another potential negative for financial stocks. While I recognize that correlation is not causation, but these correlations are fundamentally driven. The macro factors that were once tailwinds for the outperformance of the financial sector, which is dominated by the Canadian banks, are now turning into headwinds. Don't say that you weren't warned. Update schedule: I generally update Trend Model readings on my blog on weekends and tweet any changes during the week at @humblestudent. In addition, I have been trading an account based on the signals of the Trend Model. The last report card of that account can be found here. I wrote in last week's commentary (see What happens after Santa leaves?) that I believed that this year was shaping up to be another classic year-end Santa Claus rally, which consists mainly of an oversold rally bounce of washed out tax-loss selling names. I further expressed concern about the bearish message from overseas markets. So far, the market is exactly following the script that I laid out last week. 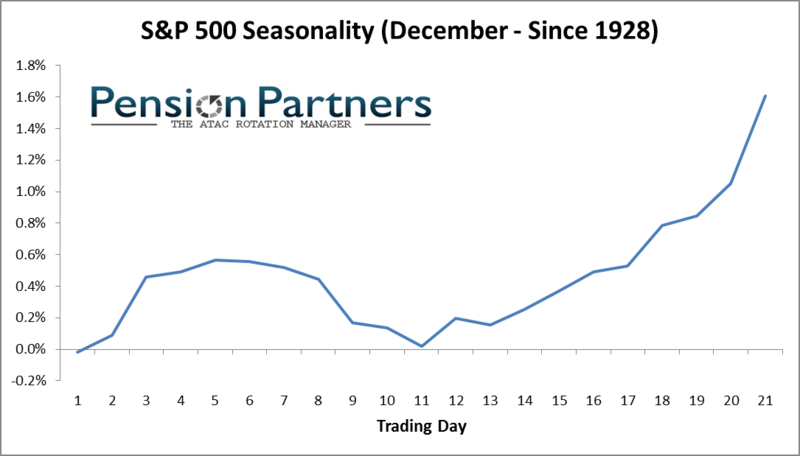 Tom McClellan recently laid out is the typical seasonal pattern of a Santa Claus rally and the 2014 stock market seems to be fairly typical of past markets. If history is any guide, the current episode of market strength is likely to start petering out in the first week of January. The key indicator to watch for the sign that the Santa Claus rally can continue into year-end and beyond is the nature of the market leadership during this period. Will relative strength led by the recent high-beta leadership, such as biotechs and semiconductors, which would be a sign of continued market strength, or down-and-out groups such as small caps and energy, which are the most likely tax-loss selling candidates and whose rallies would likely peter out soon? ...and the laggards rebounded. 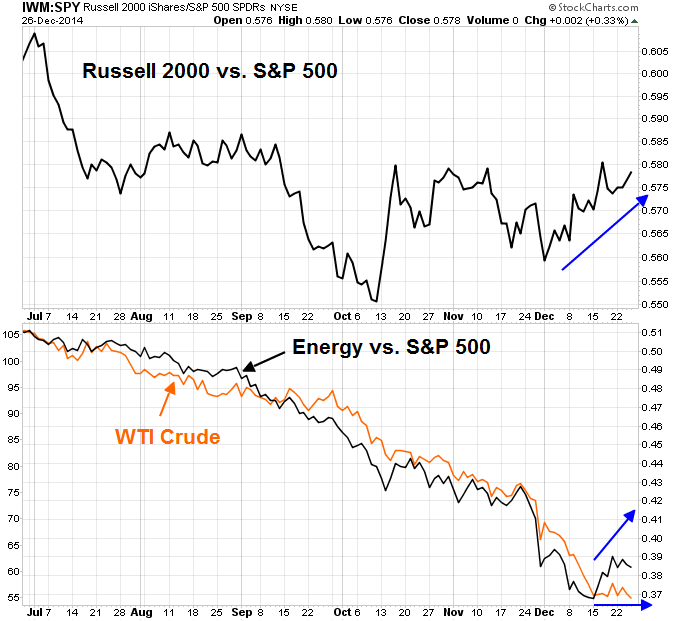 The outperformance of energy stocks, as measured by the XLE-SPY ratio on the bottom panel, is particularly impressive as oil prices were flat during the week. The rebound in small cap stocks saw both the Russell 2000 and SP 600 stage upside breakouts to new all-time highs on Friday. 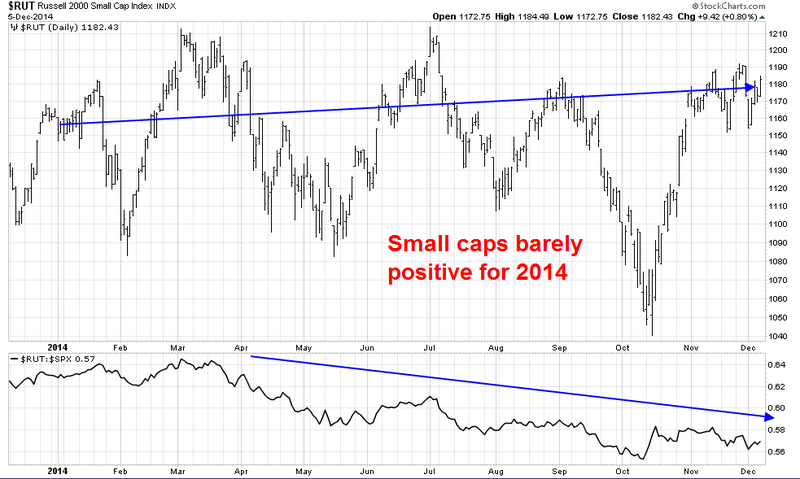 We may see additional positive momentum in small cap stocks as technically inclined traders jump on the breakout. However, I am somewhat skeptical about these breakouts for two reasons. First, the breakout was achieved with the tailwind of seasonal strength. As well, the nature of the current market leadership, which is the defensive Utilities sector, stands in stark contrast to the relative strength of high-beta small cap stocks. The chart below shows the market relative returns of Consumer Staples, another defensive sector. This defensive sector also shows a similar pattern of a rounded relative bottom. What does the relative breakout of Utilities and the emerging leadership of such defensive sectors of Utilities and Staples say about the nature of a market? Once the seasonal tailwinds are gone, it will be time to go back to the basics of my Trend Model. Unfortunately, my Trend Model is flashing warning signs because of the market action from non-US markets. As regular readers know, my Trend Model monitors the US, European and China-related markets for signs of global strength and weakness as inputs to its signals. 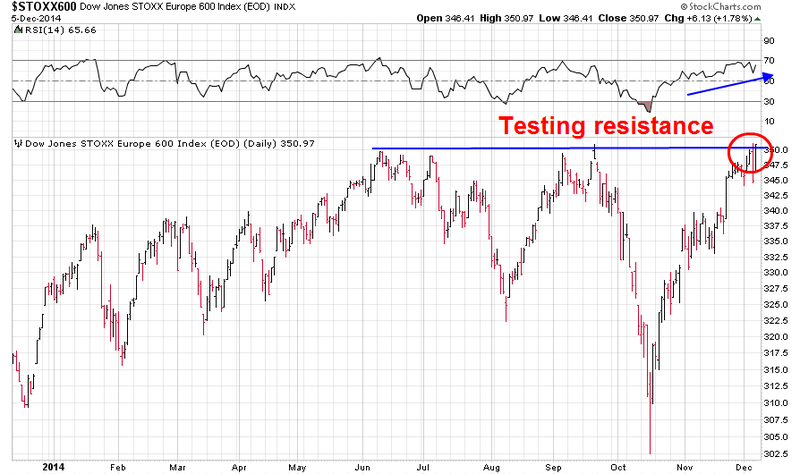 In Europe, the STOXX 600 has been rolling over and appears to be forming a rounded top. The bottom panel of the chart below shows the deviation from the 62-day Bollinger Band, which is a de-trended measure of three month average market action. Currently, readings are near the top of the historical band, indicating that the STOXX 600 is nearing an overbought reading. Here is a tough question for the bulls: If this index is rallying, as indicated by its positive deviation from the BB, but it has difficulty making new highs during a period of market strength, what happens when the current period of seasonal strength subsides? Is this a sign of underlying market strength? 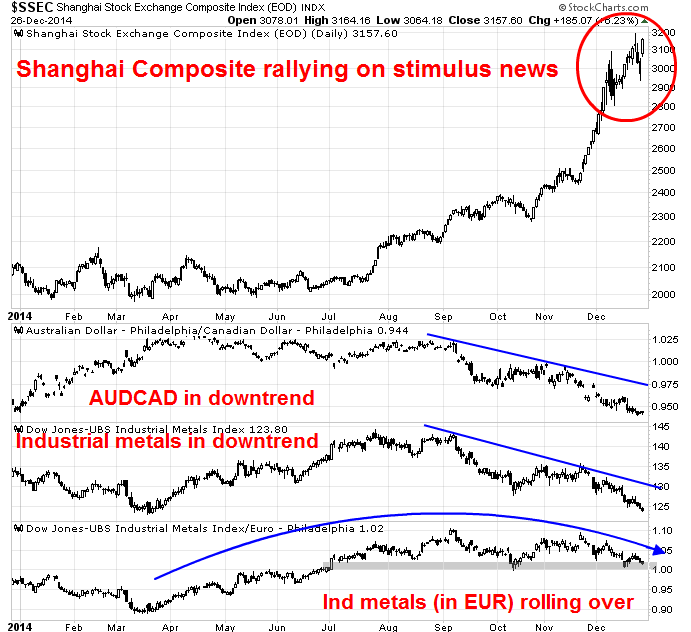 As for China, the recent strength in the Shanghai Composite has not been confirmed by my other indicators. The WSJ reported a surprise Christmas present from the PBOC this year as the central bank told Chinese banks that they will be able to "add deposits from nonbank financial institutions to their calculations of their loan-to-deposit ratios". The Shanghai Composite rallied on that stimulus announcement. It seemed that Beijing had blinked yet once more and gone back to the same-old-same-old trick of credit fueled infrastructure growth. What I found disturbing was that commodity and commodity related markets did not respond positively to that announcement. The AUDCAD cross-rate, which is a measure of Chinese economic strength as Australia is more sensitive than Canada to Chinese growth, remains in a downtrend. In addition, industrial metal prices are also in a downtrend indicating slowing global growth momentum. Even if I were to argue that commodity prices are down because of the strength of the USD, the picture still doesn't look good. The bottom panel of the above chart shows industrial metal prices in euros, which negates much of the effects of USD strength. Even that chart shows that industrial metal prices have been making a rounded top. The most constructive comment about that chart is that it is testing a key support zone and prices haven't totally cratered yet. Do the charts of European stocks and commodities tell a story of rising or slowing global growth? Does Friday`s failure of the Dow Jones Transports to make a new high, which would flash a Dow Theory buy signal, tell a story of continued market strength? 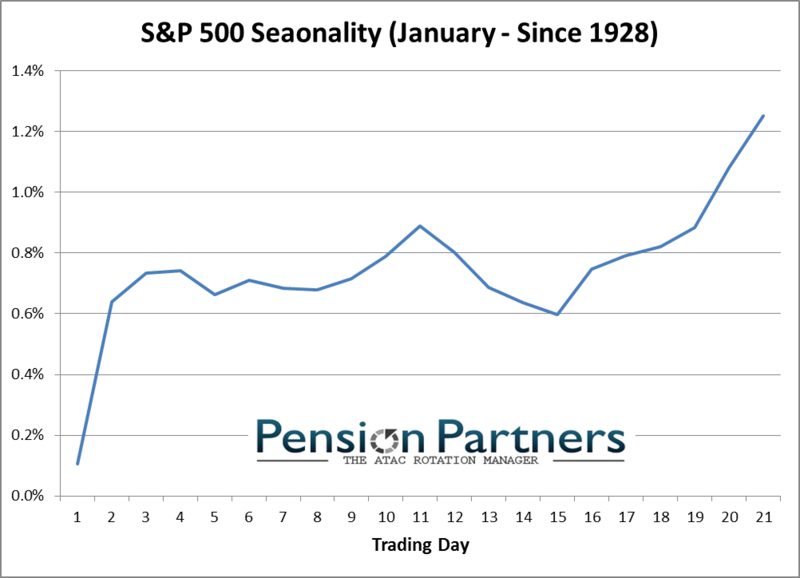 As the period of seasonal strength draws to an end in early January, do you think that you should be greedy or cautious? It`s just that EPS growth estimates have not risen much because the benefits of lower oil prices are diffuse and the Street hasn't quantified them yet. 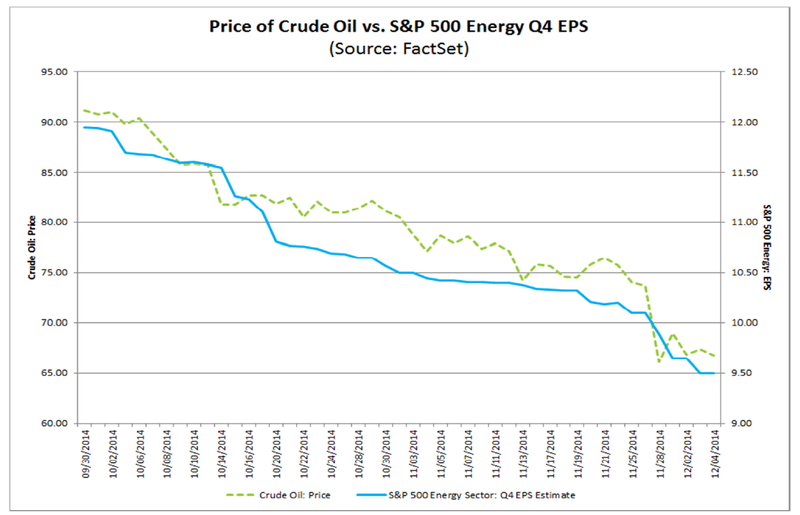 The benefits of lower energy prices will start to become apparent to the Street as we move through Q4 Earnings Season. Those upward revisions should be a catalyst for an equity rally. 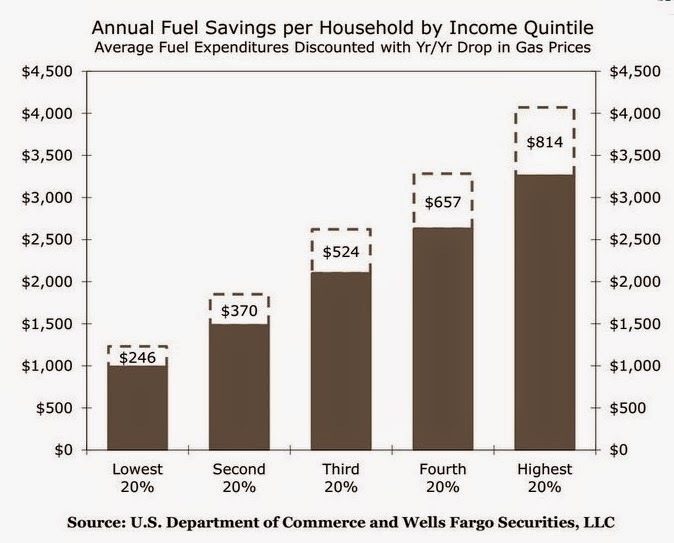 Already, we are seeing top-down analysis like this one from Wells Fargo Securities (via Business Insider) quantifying the positive effects of lower gasoline prices on the American consumer. It will not take long for the same effects to appear on a bottom-up company by company basis once Earnings Season is under way. In the meantime, my inner investor is thinking about whether he wants to lighten up his equity positions from the current aggressive risk-on position to a more neutral stance so that he can take advantage of potential market weakness to buy back in at lower prices. My inner trader is watching breadth and sentiment indicators very, very closely and he has his finger poised on the "sell" button. 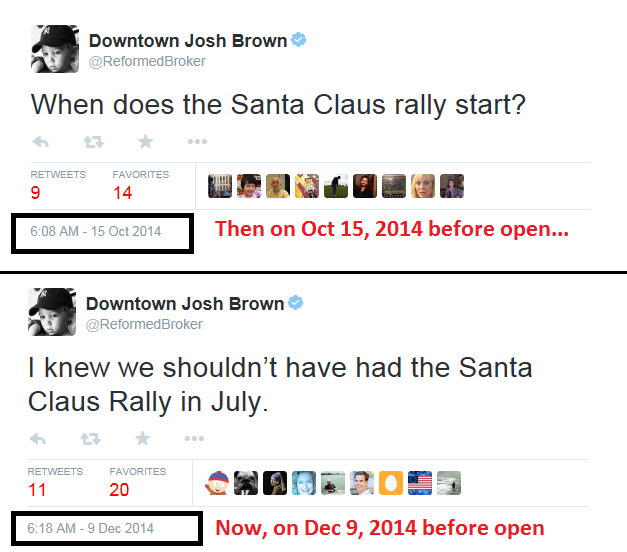 For the time being, he remains long the Santa Claus rally trade. What happens after Santa leaves? I have remained steadfastly bullish during the brief downturn in December and pounded the table to make the case for an oversold rally to begin (see Why today (Dec 9) was like the October bottom and Dear Santa, May I have new highs for Christmas?). If you followed my writing and profited from the current melt-up, I urge you to show your appreciation by contributing to the Vancouver Youth Symphony Orchestra by clicking here (also please see No guarantees, but...). However, I remain concerned as non-US markets are misbehaving and their market action is suggestive of economic weakness. Such signals have the potential to spook the global growth outlook once the seasonal rally peters out. In fact, it is only the combination of the short-term seasonal pattern and the recent oversold readings that have kept the Trend Model from moving to a more cautious reading. The government garnered 160 votes in the first round of crucial presidential elections on Wednesday, performing slightly worse than anticipated and increasing speculation about snap polls. In addition to the 155 coalition MPs, five independents backed the government’s candidate, former European commissioner Stavros Dimas. Another 135 voted “present” while five were absent. The result was far short of the 200 votes required in the first round, a target that the government is also certain to miss in next week’s second round. However, ahead of the critical third vote on December 29 when the threshold drops to 180, the government had hoped to gain between 161 and 165 in the first round in a bid to build momentum for the votes to come. Across the English Channel, UK stocks are showing even a greater level of weakness. The energy heavy FTSE 100 is in a downtrend and the most recent rally barely regained the 50 dma. Moving to Asia, Mr. Market is also showing his concerns over the outlook for Greater China. The Shanghai Composite (top panel) has begun to pause from its recent rally as it appears that the parabolic rise is accounted mainly by speculative activity in the wake of the Shanghai-HK link-up.By contrast, the other regional stock markets of China's major Asian trading partners (middle panels) have not confirmed the strength in Chinese stocks as they have all broken their uptrends. In addition, the AUDCAD currency cross (bottom panel), which is important as both Australia and Canada are resource economies but Australia is more sensitive to Chinese growth, is tanking. 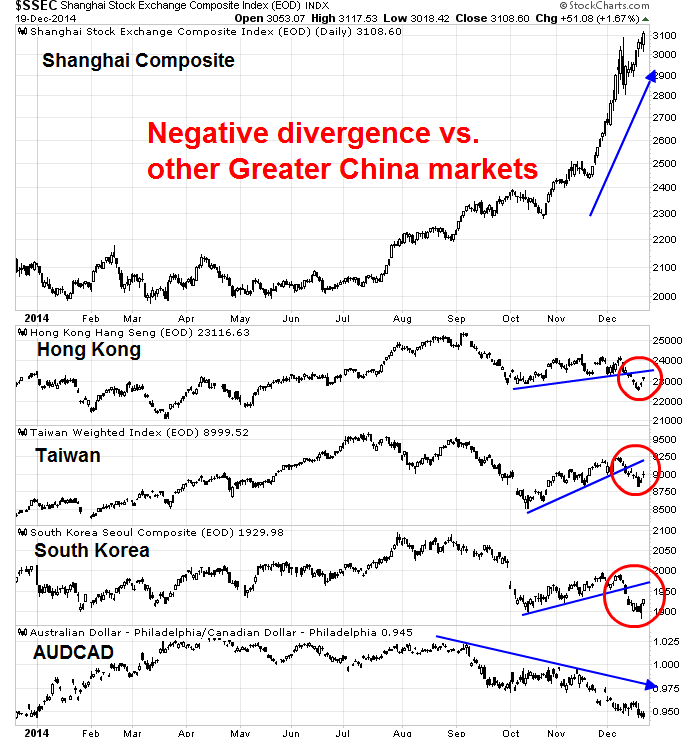 These are all signs that the market is concerned about slowing Chinese growth. Another worry that I am seeing is the lack of signs that China is re-balancing its economy from credit-driven infrastructure growth to the consumer led growth. The chart below shows two relative return pair trades of New China to Old China, as measured by the PGJ-FXI pair (in black) and CHIQ-CHIX pair (green). By any measure, Old China is outperforming New China. 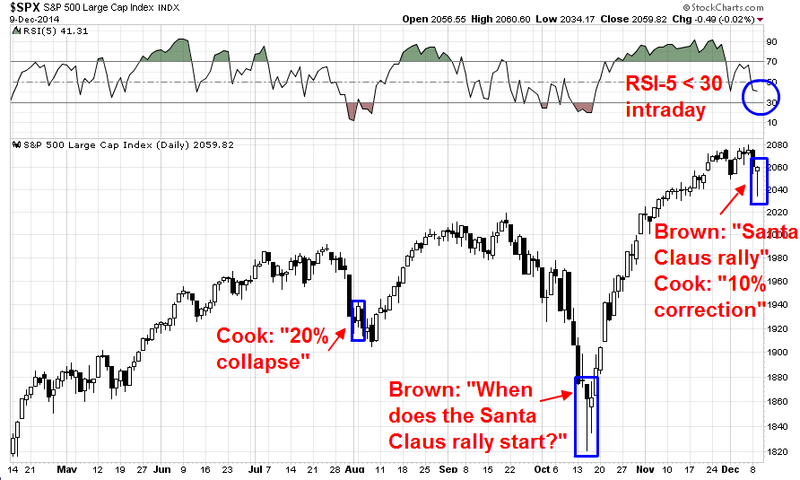 Is Santa Claus rally sustainable? With weakness evident in overseas markets, the key question is whether US equities can de-couple and continue to strengthen in the face of rising global worries. In other words, is the current US market rally just a seasonal snap-back rally after the weakness seen in early December, or is it more reflective of confidence of continued US economic growth? My base case scenario at this point is we are seeing a typical oversold rally from tax-loss selling which will stall out in early January. That`s because forward EPS estimates are falling, indicating the current lack of a fundamental backdrop for stock market strength. 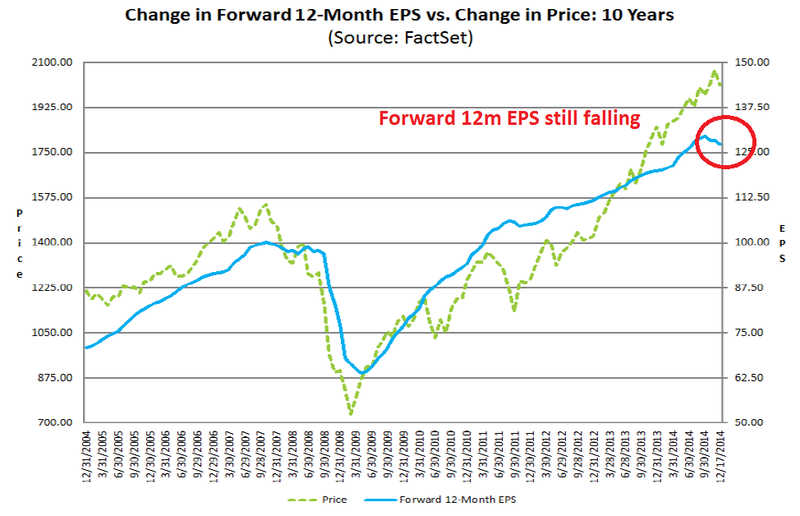 The latest weekly analysis from John Butters of Factset shows that forward EPS is still falling (annotations in red are mine). Such episodes have historically coincided with equity market weakness. Overall, the sentiment index rose to a higher-than-expected 93.8, mirroring levels seen in boom years like 1996 and 2004. 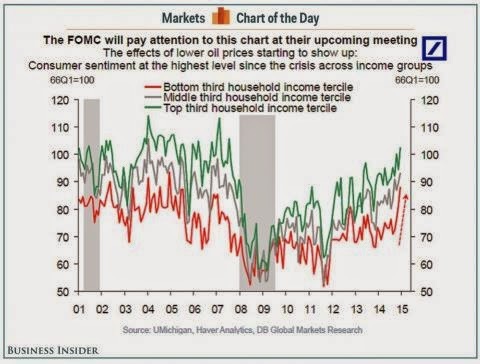 The best part is that the biggest increase in optimism comes from the lowest 1/3 of households measured by income. It's not too difficult to believe that lower gas prices and consistent job gains of over 200,000 a month, with unemployment under 6%, are finally having an effect. Tactically, here is what I am watching. The key indicator to watch for the sign that the Santa Claus rally can continue into year-end and beyond is the nature of the market leadership during this period. Will relative strength led by the recent high-beta leadership, such as biotechs and semiconductors, which would be a sign of continued market strength, or down-and-out groups such as small caps and energy, which are the most likely tax-loss selling candidates and whose rallies would likely peter out soon? The chart below shows the relative returns of these groups. If the beaten down groups like energy and small caps start to show relative strength, then the Santa Claus rally is most likely to be short-lived and traders should be wary of a post-New Year hangover. 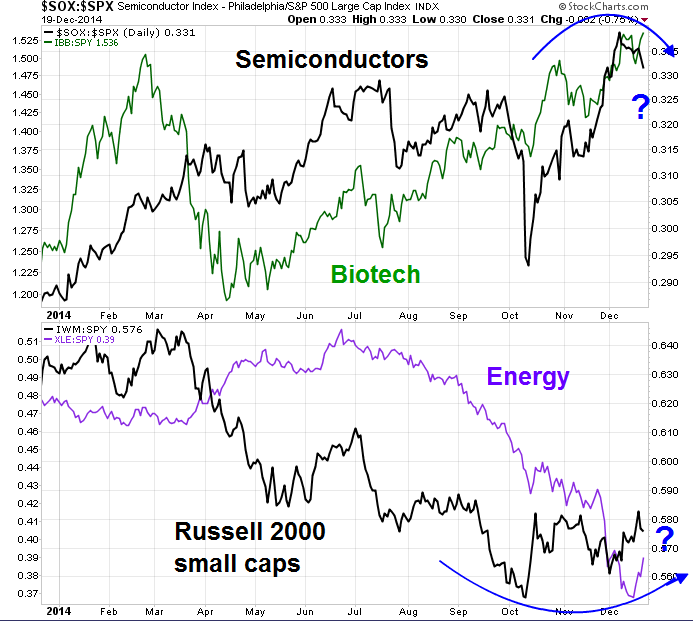 If, on the other hand, we see continued strength from leading groups like the biotechs and semiconductors, then the bull run is far more likely to continue. In the meantime, my inner trader remains long this market. He is nervously watching how foreign markets and US market leadership will behave in the next week or two. Dear Santa, may I have new highs for Christmas? I have been calling for an oversold rally to start in the past week. Even though my calls were early, it seems that a V-shaped bottom and meltup is in process. In my last weekend post (see 2015: Bullish skies with scattered periods of volatility), I pointed to the combination of VIX term structure inversion and TRIN over 2 as a virtually certain bottom calling indicator. The chart below shows the past instances, marked by vertical lines, when this indicator has generated buy signals. The blue lines indicate past episodes when it successfully marked a short-term bottom in the last four years and the red line shows the one time when it failed. In addition, I have been watching the levels of NYSE new 52-week highs (green) and 52-week lows (red). 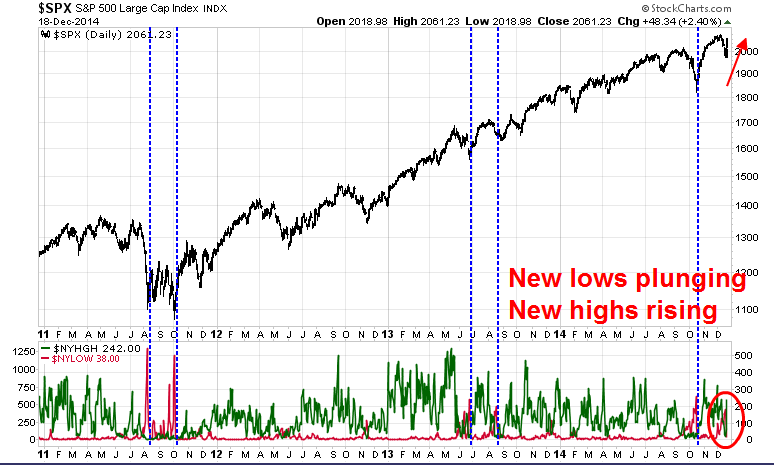 Most recently, the new low count has spiked to extraordinarily high levels and then retreated. I have marked with vertical lines the past occurrences of this condition in the last four years. Each of those episodes were associated with V-shaped bottoms and subsequent rallies to new highs in the SPX. If history is any guide, we should see Santa Claus bring investors new highs in the major US equity averages, either before year-end or shortly into 2015. As the stock market has been on a tear in the past two days, it would not surprising to see it pause Friday and possibly stage a minor pullback. Should that happen, it would provide a good entry point for traders who missed have missed this powerful rally to get long. I have been writing Humble Student of the Markets for a little over seven years. I have used this blog to voice my own thoughts and I have asked nothing in return from my readers, except for their comments. There is, however, one way that you can show your appreciation for my writing. During this holiday season, I would like to launch my personal appeal for support of the Vancouver Youth Symphony Orchestra, to which I am a volunteer board member. I have kept my writing free since I started this blog. If you have found my work to be valuable, please show your appreciation by donating to this worthy cause by clicking here. I have long believed that one of the ways to nurture youth is to give them a focus in their lives, whether it be music, sports or other pursuits. This is especially critical during their adolescent years as they start to form their own identities. It's one of the key reasons why I became involved with the Vancouver Youth Symphony Orchestra Society. Participation in a VYSO orchestra teaches young musicians to focus on both their individual musical and orchestral skills. The latter is particularly important as many people can learn to play music, but a different skill is required when the conductor points to a section and have them all play the same sound at the same time. It's much like the difference between learning to walk and learning to march in formation. The Vancouver Youth Symphony Orchestra Society is a registered charity and tax receipts are available to contributors who are Canadian residents. They say that there are no guarantees in life or investing, but there is one guarantee that if you participate in this offer, you'll feel better about yourself. Thank you for your support and my best wishes for everyone for this festive season. Last week I allowed my inner trader to take the stage (see My trading plan for December) and this week my inner investor will take to the podium. However, I will have a brief trading comment in light of the stock market downdraft seen in the last week. How are forward earnings evolving? What is the outlook for the US economy? What are the chances of a recession, which would induce an equity bear market? My main conclusion is that investors were spoiled in 2014 as stock prices went up more or less in a straight line, but the 2015 stock market, though appearing bullish, will see bouts of gut wrenching volatility. 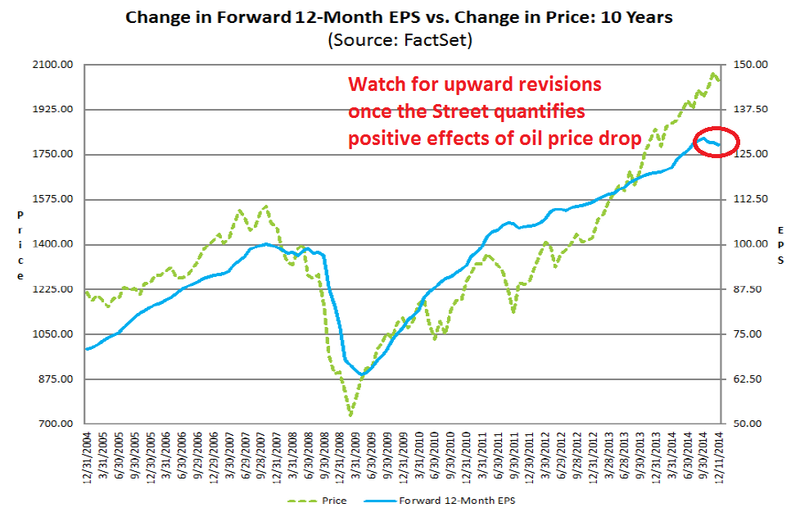 John Butters at Factset has neatly illustrated the importance of forward EPS to stock prices with this chart (annotations in red are mine). Forward EPS has tracked stock prices closely in the last 10 years and there is no reason to believe that they won't continue to do so. On the other hand, the positive effects of falling oil prices have not been quantified by the Street yet. During the Asian Crisis, I can recall sitting in a meeting to assess its effects in light of what we were seeing in our quant models. One of our EM portfolio managers said that estimate revisions were not moving yet because analysts know that earnings are bad, they just have no idea how bad so they are not revising them yet. In the current instance where oil prices have cratered, the Street knows that the effects are good because of lower input prices and higher consumer spending, they just have no idea how good yet. As a consequence, EPS estimates are not rising. 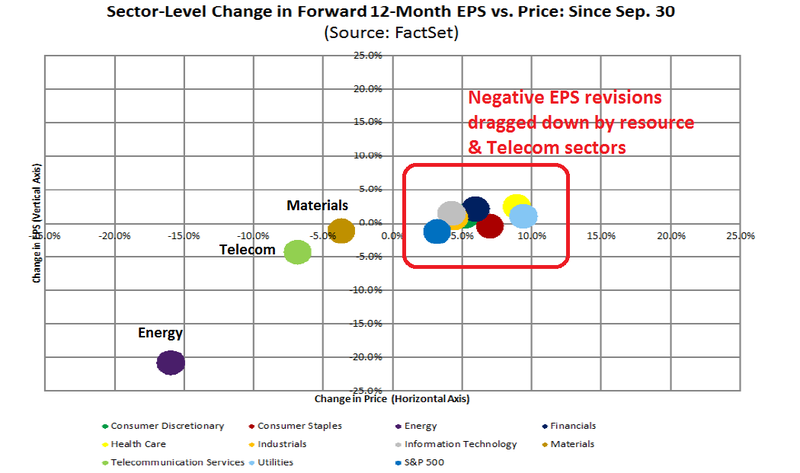 The chart below from Factset (red annotations are mine) show that we are mainly seeing only the negative effects of the oil price drop, as SP 500 EPS estimates have been dragged down mainly by resource sectors (and Telecom, which has a tiny index weight), while EPS estimates for the other sectors are flat to slightly up. Expect the positive effects to start filtering through in the weeks ahead. The second question in my analytical framework is to gauge the health of the American economy. While economic growth does not correlate well with the stock prices, it does bear a major influence on the corporate earnings and revenue outlook. 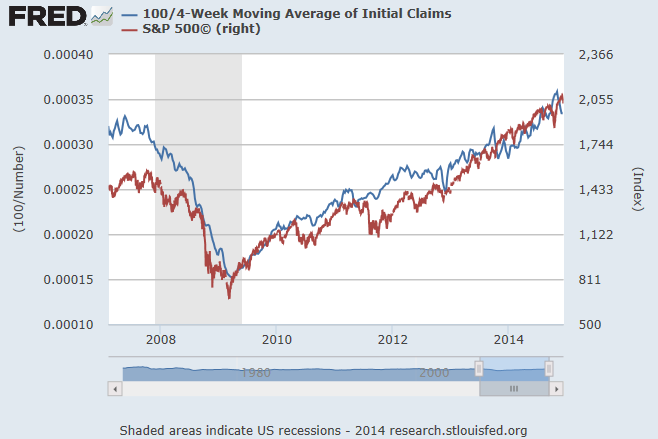 This chart shows how closely tied the employment picture, as measured by initial claims (inverted), to the SPX. Looking at the internals of the report, there were broad upward revisions to key areas that were slightly weak last quarter, including consumption, fixed investment, and inventories. We previously said that inventories were due for an upward revision after a very weak initial reading, while we expected net trade - especially imports - to be revised upwards, negatively impacting total growth. The rest of the revisions, which we did not expect, were positive: higher consumption and higher investment. As a consequence, domestic final private demand, which strips out trade, government, and inventory changes, jumped half a percent, coming in at a healthy 2.48%, while final demand registered a 4.02% increase. While Q3 GDP was unusually high and Q4 will likely see a negative snapback, the general outlook remains positive. Indeed, we saw a clue of the positive effects of falling fuel prices when retail sales and consumer sentiment surprised to the upside last week. 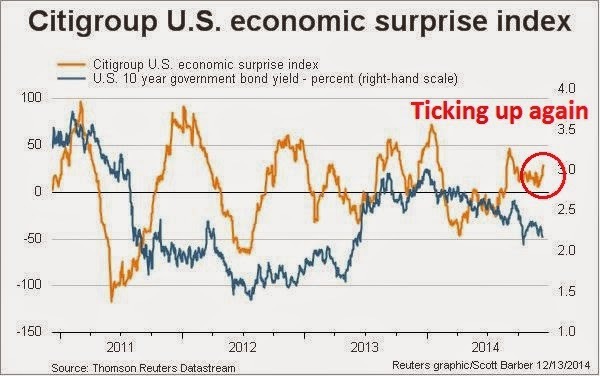 Indeed, the Citigroup US Economic Surprise Index is ticking up. The combination of a steadily growing economy with falling energy prices should result in rising EPS estimates in the very near future. I therefore look for stock prices to continue their climb into 2015. 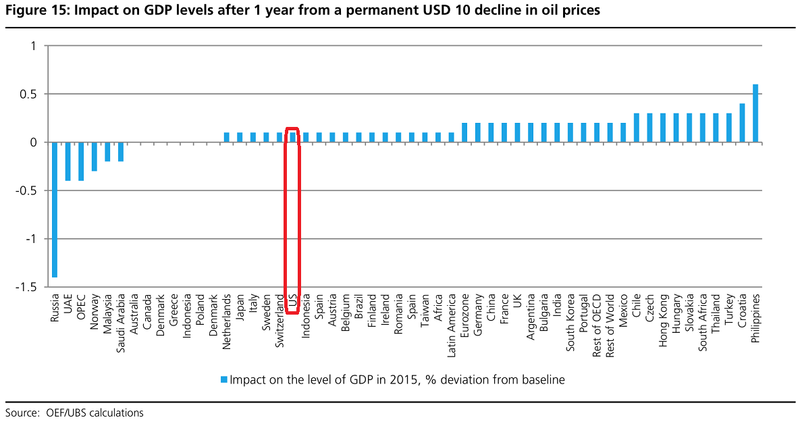 Falling oil prices should also be a net positive for global growth. Business Insider recently highlighted the UBS estimates of the effect on GDP growth. If we were to focus on the US, UBS estimates that a $10 decline would boost US GDP growth by 0.1%. 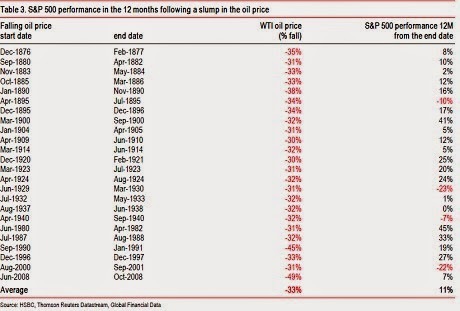 Assuming that oil prices stabilize at $70-80, the current fall from about $105 would translate into incremental GDP growth of 0.3% for the American economy. Tumbling oil prices are a bonanza for global stock markets, provided the chief cause is a surge in crude supply rather than a collapse in economic demand. HSBC says the index of world equities rose 25pc on average over the twelve months following a 30pc drop in oil prices, comparable to the latest slide. Equities rose 19pc in real terms. What happens to interest rates? Geopolitical instability in oil producing countries. When lift-off occurs, the pace of monetary policy normalization will depend, in part, on how financial market conditions react to the initial and subsequent tightening moves. If the reaction is relatively large—think of the response of financial market conditions during the so-called “taper tantrum” during the spring and summer of 2013—then this would likely prompt a slower and more cautious approach. 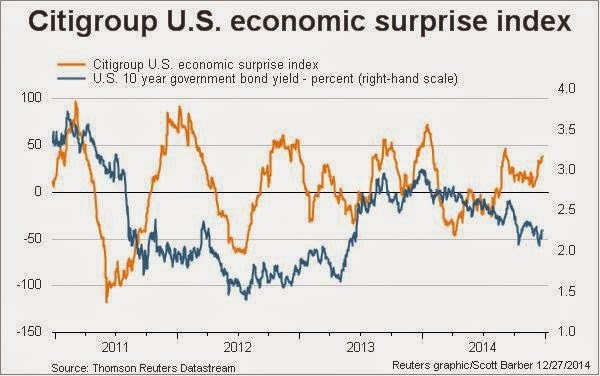 In contrast, if the reaction were relatively small or even in the wrong direction, with financial market conditions easing—think of the response of long-term bond yields and the equity market as the asset purchase program was gradually phased out over the past year—then this would imply a more aggressive approach. The key point is this: We will pursue the monetary policy stance that best generates the set of financial market conditions most consistent with achievement of the FOMC’s dual mandate objectives. This depends both on how financial market conditions respond to the Fed’s policy actions and on how the real economy responds to the changes in financial conditions. Because financial market conditions affect economic activity only slowly over time, this suggests that we should look through short-term volatility and movements in financial markets. We should not respond until we become convinced that the movements will likely, without action on our part, prove sufficiently persistent to conflict with achievement of our objectives. Often, financial markets can be quite volatile and move a lot without disturbing underlying economic performance. The Fed expects higher volatility in 2015. So should investors. The dance had become so routine that we at the Brussels Blog were thinking of giving it a name, the Eurozone Two-Step. Ever since the eurozone crisis first rocked international markets nearly five years ago, European Central Bank chiefs – first Jean-Claude Trichet, then Mario Draghi – sent a very clear message to the currency union’s political leaders: we can only act if you act first. The deal was never explicit, but both sides knew what was required. The ECB’s first sovereign bond purchase programme in May 2010 came only after eurozone leaders created a new €440bn bailout fund; its €1tn in cheap loans to eurozone banks in early 2012 only came after political leaders agreed to a new “fiscal compact” of tough budget rules. Progress on that 2012 blueprint has since stalled, however, and at his last summit press conference, then-European Council president Herman Van Rompuy said the new “Four Presidents Report” would be delivered at the December EU summit, which starts next Thursday. Many in Brussels saw this as the quid for Draghi’s quo – once the leaders agreed to another blueprint for eurozone integration, Draghi would have a free hand to launch QE. But according to a leaked draft of the communiqué for next week’s summit, Draghi may have to deliver his quo without a eurozone quid. The text (which we’ve posted here) makes clear that leaders have no intention of delivering a new blueprint any time soon. This means Draghi won’t have the normal political cover he needs to make a bold decision early next year – a problem only compounded by the European Commission’s decision last month to put off the day of reckoning for France and Italy over whether they will face sanctions for failing to live up to the EU’s crisis-era budget rules. This kind of uncertainty will undoubtedly spook markets. But make no mistake, regardless of what the Greeks, Draghi, Weidmann, Merkel et al say, the major players are all wedded to the idea of a united Europe (see A history lesson, why Europe should try to be more Canadian and Lest we forget, or why you don't understand Europe). Even the leftist Syriza party in Greece has stated that they would like to remain in the euro. Just remember this. Mom and Dad fight and the kids hear everything, but the parents remain committed to each other and they will find a way past the crisis. In the short-term, however, the combination of sputtering European growth, uncertainty over ECB policy and political turmoil in Greece will likely spark more market volatility in 2015. Yet perhaps the biggest cloud on the immediate horizon is the one implied by Mr Cameron’s warning – that of political instability. Nowhere is this more apparent than in Britain itself. Whatever your views on Britain’s Coalition government, it has, against most predictions, proved a remarkably stable political construct, which – given manifest challenges – has also achieved a commendable degree of economic stability. This is unlikely to be the case after the general election on May 7. Political leaders in the UK do occasionally manage to shift the dial in the last few months of campaigning, John Major in 1992 being the most recent example. But it’s a rarity, and in any case, the old bi-polar rules of politics no longer apply. Unless something dramatic happens to change things, we can be pretty sure that the polls as they stand are roughly where they will finish. This would give rise to two possible governments, neither of which would be at all appetising or would last for very long – a Conservative-led minority government with support from Ukip and Irish Unionists, or some kind of cobbled-together Left-wing coalition of Labour, SNP, Lib Dem and Greens. Britain could become literally ungovernable after the election, with no single party or coalition of parties able to form a majority government. Current public opinion polls predict that neither the Conservatives nor the Labour Party will win enough seats to form a majority government — even in a coalition with Liberal Democrats. Conservative-Liberal and Labour-Liberal majorities may both prove arithmetically impossible because of the rise of previously insignificant fringe parties. The Scottish Nationalists look able to boost their six seats in Parliament to anything between 20 and 50, largely at Labour’s expense. The United Kingdom Independence Party is threatening dozens of Conservative incumbents. Meanwhile, the Liberals are almost certain to lose about half their 56-seat representation. As a result, a ruling coalition may have to include not just two parties but three or four, including fringe nationalist groups. The Scottish National Party is sure to demand another Scottish independence referendum as its price for supporting a coalition, while the UK Independent Party will likely insist on Britain’s withdrawal from the European Union. It is hard to imagine either Labour or Conservatives agreeing to such terms. This means that a government may have to be formed without a majority in Parliament. While minority governments are quite common in continental Europe, the British Parliament has only once failed to produce a government majority — during a brief interlude in 1974 under Harold Wilson. It created seismic upheavals in Britain’s adversarial politics. A multiparty coalition or minority government, even if it can be patched together in post-election haggling, will probably collapse within a year or two. Whether the next prime minister turns out to be Cameron or Labour’s Ed Miliband, he will be seen as a short-term caretaker, passing only non-controversial measures. At some point in 2016 or 2017 at the latest, the opposition parties are almost certain to unite in a vote of no confidence on some major issue — bringing down the government. This would force a new election in spite of the theoretical requirement that Parliament should serve a fixed five-year term. The near-certainty that whatever government emerges in May will fall within a year or so, raises the third and most troubling business issue. A snap election in 2016 or 2017 is most likely to produce an overtly euro-sceptic government, committed to taking Britain out of the European Union. At worst, the specter of a Brexit vote would loom over Europe. At best, Westminster politics would become Italian. The markets wouldn`t like that kind of political roller-coaster ride at all. In the meantime, oil below $70 is already playing havoc with budgets across the global petro-nexus. The fiscal break-even cost is $161 for Venezuela, $160 for Yemen, $132 for Algeria, $131 for Iran, $126 for Nigeria, and $125 for Bahrain, $111 for Iraq, and $105 for Russia, and even $98 for Saudi Arabia itself, according to Citigroup. What happens if the regime change occurs and the west has to put boots on the ground in Nigeria, Libya or Algeria? Are those kinds of scenarios in the market? Opec may not be worried about countries such as Nigeria, but even there a full-blown economic and political crisis could turn the north into a Jihadi stronghold under Boko Haram. The growing Jihadi movements in the Maghreb – combining with events in Syria and Iraq – clearly pose a first-order security threat to the Saudi regime itself. The Libyan city of Derna is already in the hands of the Salafist group Ansar al-Shariah and has pledged allegiance to Islamic State. Terrorist movements in the Egyptian Sinai have also rallied to the black and white flag of IS, prompting Egypt’s leader Abdel al-Sisi to call last week for a “general mobilisation” of all leading Arab and Western powers to defeat the spreading movement. The new worry is Algeria as the Bouteflika regime goes into its final agonies. “They have an entrenched terrorist problem as we saw in the seizure of the Amenas gas refinery last year. These people are aligning themselves with Islamic State as part of the franchise,” said Mr Newton. Algeria exports 1.5m bpd of petroleum products. Its gas exports matter more but the price of liquefied natural gas shipped to Europe is indirectly linked to oil over time. Mexico's biggest protests in years began two months ago in response to the Sept. 26 attack on students by corrupt police and drug cartel gunmen. Demands have widened to include the resignation of President Enrique Peña Nieto. Protesters also rage against pervasive corruption, violence and disappearances suffered during years of narco bloodshed. The movement has even led to solidarity rallies in the US. Political analysts are trying to figure out what the movement represents and where it could lead. Some are comparing it with “Occupy” in the US and the “Indignados” (the outraged) in Spain: Fed-up Mexicans are spreading their messages using social media and have few visible leaders. If the situation continues along the present course, Mexico may soon follow the path of Peru during the auto-coup of Alberto Fujimori in 1992 — all while the Obama administration looks on. Unless the citizens of the United States rise up in support for and solidarity with their Mexican neighbors, the country could fall prey to a new U.S.-backed dirty war against students and activists similar to the repression during the 1970s and 1980s, which took hundreds of thousands of lives in Guatemala, El Salvador, Nicaragua and Honduras. There is still time to act before North America today becomes a copy of Central America 30 to 40 years ago. I don't want to be a doomster or fear-monger. While I have laid out a number of dire scenarios, you should not necessarily interpret them as bull market killers. The US economy remains in the mid-cycle phase of an expansion and such a scenario should be equity positive. The key question to ask of any risk is, ”How will this event affect the outlook for earnings, interest rates or global financial system stability?” If the answer is, ”Not very much”, then the likely outcome is some sort of corrective action in a stock market bull trend. 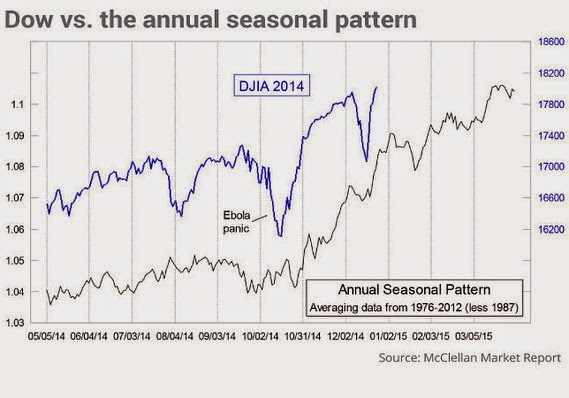 In short, my inner investor remains cautiously bullish on equities for 2015, though with higher levels of volatility. Choppiness and gut-wrenching corrections, yes, but don't expect a bear market to start. Finally, I have a brief trading comment. My inner trader was caught off-guard by the swiftness of the the sell-off. The Trend Model had flashed an unconfirmed trading sell signal on Tuesday and I usually wait a couple of days before acting on trend following signals as they have a habit of reversing themselves. But the short-term trading model was signaling oversold conditions consistent with a market bottom at the close Tuesday (see Why today (Dec 9) was like the October bottom) and Thursday (see Here for a good time, not a long time). As the closing bell rang on Friday, my most consistent bottom-calling models were flashing buy signals. 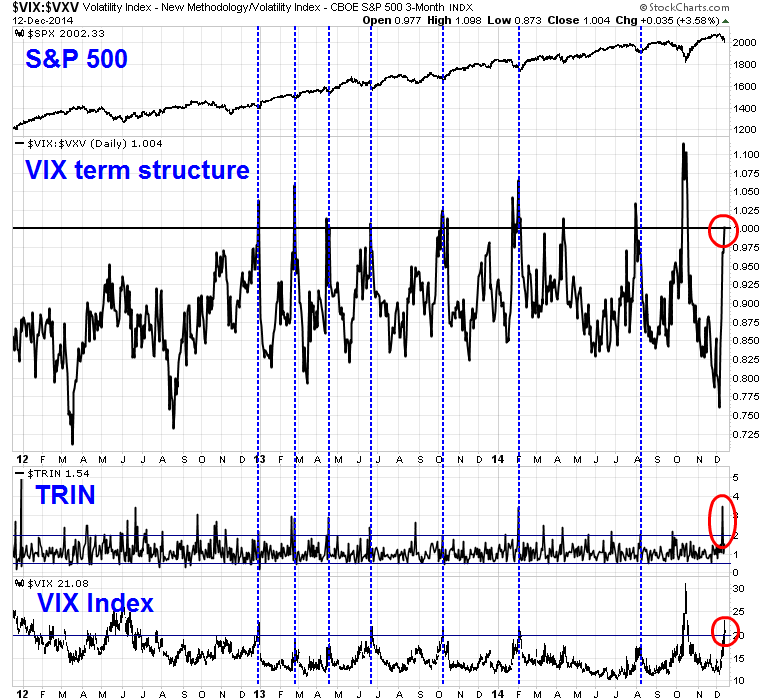 As seen in the chart below, the combination of an inversion of the VIX term structure and TRIN greater than 2 forms a powerful buy signal that was 100% in the last two years. In addition, the VIX Index had closed above 20, which is a level that is consistent with trading bottoms. In retrospect, my inner trader wished that he could have caught the downdraft, but by the time he received confirmation of the downtrend, it was too late to sell and it was time to buy. Nevertheless, there remains a high level of event risk next week, with the FOMC meeting and Greek election on Wednesday (see the discussion at Here for a good time, not a long time). My inner trader therefore remains modestly long equities at this point and nervously hoping for a rally in the early part of the week. OK, I was a day early in my bottom call (see Why today (Dec 9) was like the October bottom), but my short-term trading models continue to indicate that we are seeing a short-term bottom in the SPX. First, option traders are getting frightened, which is contrarian bullish. The ISEE equity-only call-put ratio were very low all day, on Thursday December 11. Readings under 100% often indicate a crowded short. 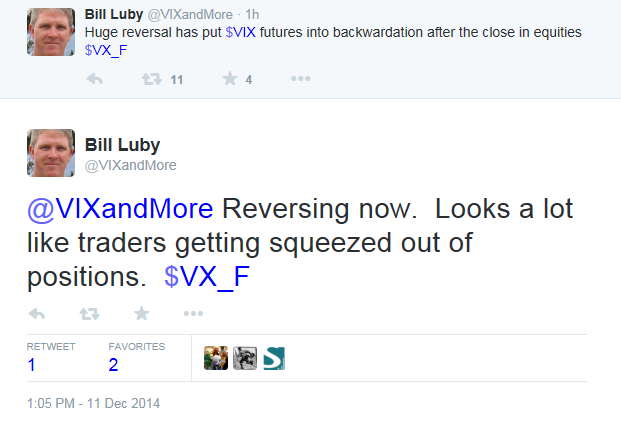 As well, Bill Luby, who blogs at VIX and More, observed in a tweet that the VIX term structure had briefly inverted just before the market close. 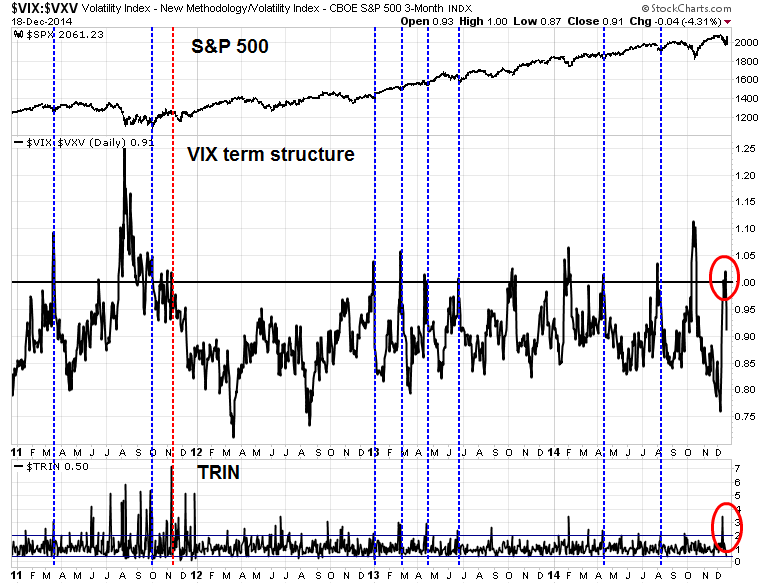 VIX term structure inversion is an indication of extreme fear in the market. From a technical standpoint, the SPX chart below also flashed a couple of tactically bullish signals. First, the 5-day RSI, which is useful for swing trading short-term moves, moved off an oversold level of below 30. Such events are often signal upside for the index. Candlesticks and their respective patterns illustrate the psychology of the market at a particular point in time. Specifically, the inside candle represents a period of contracted volatility. If, in an uptrend, volatility begins to slow and the market fails to make a new high (as illustrated by the inside candle), then we can deduce that strength is waning and that the chance for a reversal exists. When combined with a Bollinger Band®, we ensure that we are trading a reversal only by either selling high prices (higher Bollinger Band®) or buying low prices (lower Bollinger Band®). In this way, we trade for the big move; not necessarily selling the low tick or buying the bottom tick but definitely buying near the relative bottom and selling near the relative top. The key is confirmation. Should the stock market rally as I expect, I would nevertheless be wary of volatility stemming from major event risk next week. First, there is the Greek presidential election on December 17. Already, Greek bond yields and stock market are plunging over the political uncertainty. Market expectations that lift-off will occur around mid-2015 seem reasonable to me. Although that could change depending on how the economy evolves, my views on “when” do not differ appreciably from the most recent primary dealer and buy-side surveys undertaken by the New York Fed prior to the October FOMC meeting. Let me be clear, there is no Fed equity market put. 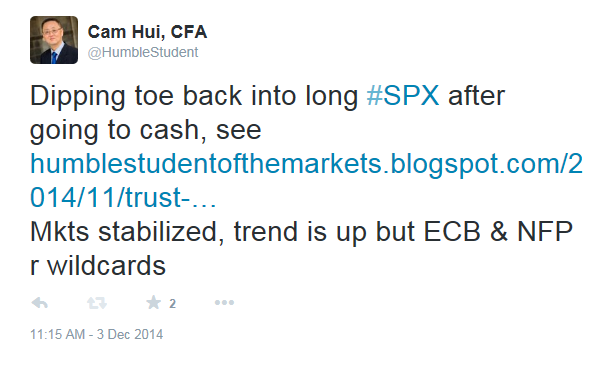 To put it another way, we do not care about the level of equity prices, or bond yields or credit spreads per se. Instead, we focus on how financial market conditions influence the transmission of monetary policy to the real economy. At times, a large decline in equity prices will not be problematic for achieving our goals. For example, economic conditions may warrant a tightening of financial market conditions. If this happens mainly via the channel of equity price weakness—that is not a problem, as it does not conflict with our objectives. In contrast, when we want financial market conditions to be extremely accommodative—as has been the case in recent years when we have been far away from our employment and inflation objectives—then we will take into consideration a broad set of developments with respect to interest rates, the stock market and other measures of financial conditions in choosing the appropriate stance for monetary policy. Just be warned that traders who go long here should be here for a good time, but not a long time. On December 17, all bets are off. When I woke up this morning, I saw that stock index futures were deeply in the red. 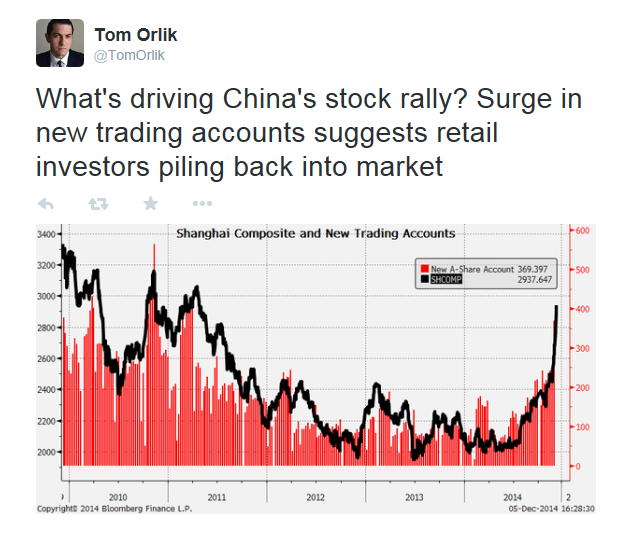 The headline explanation was the Chinese authorities had taken steps to cool off stock market speculation. Later, I saw that there were jitters over a the unexpected Greek Presidential election call. Whatever the cause for the weakness, US stock indices gapped down at the open, but started to recover at around noon after the European close. By the end of the day, the SPX managed to recover all of its losses and close the day flat and the NASDAQ Composite and the small cap Russell 2000 were actually positive on the day. 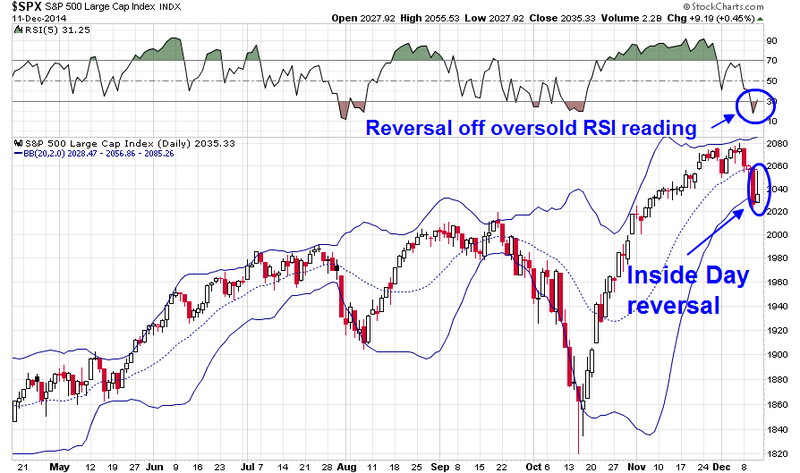 As the chart below of the SPX shows, the market displayed a classic pattern of a reversal bottom. There were also a number of quirky signs that today marked a bottom of any temporary stock market weakness. First and foremost, the 5-day RSI (top panel) moved from an overbought reading of over 70 on November 28 to under 30 on an intra-day basis, which indicates an oversold reading. 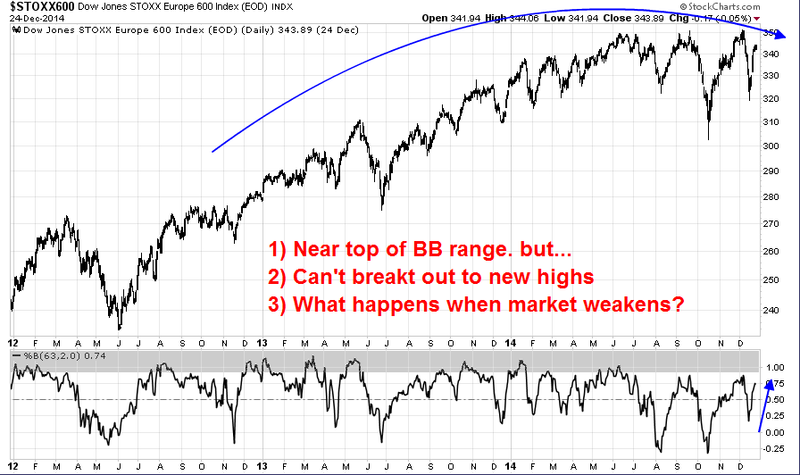 Such conditions are often indicative of either short-term bottoms or minimal market downside. The key short-term stock market indicator that I have used for many years is exceptionally rare, but once triggered is deadly for the bulls. The last time it triggered, the S&P 500 SPX, -0.02% shed 180 points — and the configuration now is almost identical to then. Accordingly, I expect a 10% decline in the S+P 500 before Jan 30 if the S&P 500 dips below 2049 this week. “The Tick readings I am seeing (-1100 and -1200) is like an accelerator on the floor that is pressed for an indefinite amount of time,” Cook says. “Eventually the motor will run out of gas. Now, anything that comes out of left field will create a strain on the market.” Since the CCT is a leading indicator, prices have to catch up with the negative Tick readings. How did the 20% decline forecast work out? The stock market fell slightly after the publication of that warning in August but bottomed out that week (see SPX chart above). While this is not meant to be an indictment of Mark Cook and his technical analysis abilities, it is more of an indictment of Marketwatch editors, who chose to feature bearish headlines just as the selling frenzy hit its peak. Sometimes it can be rewarding to monitor these quirky market indicators as measures of sentiment. Based on my assessment of the market technicals today, I would venture a guess that the near-term downside for stock prices is limited. Leeson on Friday pointed to his firm’s crowd sentiment poll, which recently clocked in at “extremely optimistic” levels. Chart watchers often consider sentiment to function as a contrary indicator, one that can presage overly enthusiastic markets that are ripe to turn lower. More specifically, Leeson singles out massive money flows into large-cap stock ETFs like the SPDR S+P 500 ETF (SPY) and the SPDR Dow Jones Industrial Average ETF (DIA) as a red flag. In November, all large-cap stock ETFs took in $25 billion, the most ever. 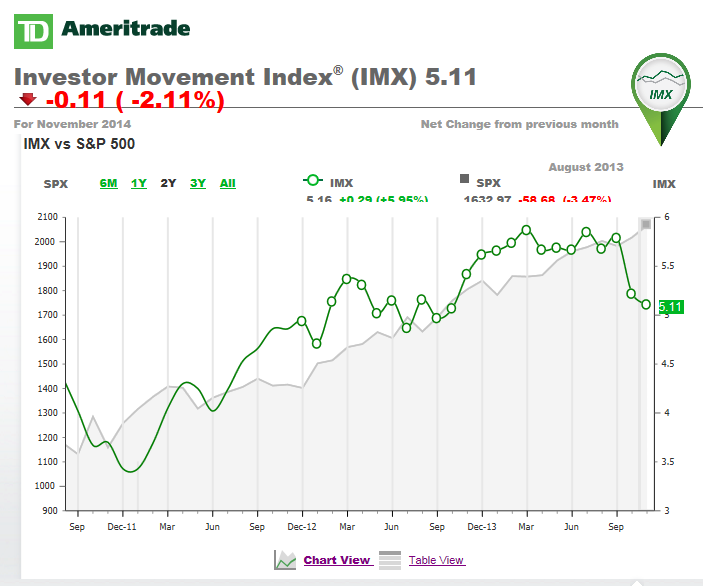 Patient retail money: TD Ameritrade IMX is more reflective of the behavior of the slower, patient individual investor. I interpret these readings as the stock market looking a bit overbought in the short-term and may be in need of a pause, but, as the mom-and-pop retail investor isn`t all-in yet, stock prices have more room to rally on an intermediate term basis. As the year draws to a close, I thought that I would do something a little different and allow my inner trader to outline his trading plan for December. Next week, my inner investor will have his chance to address his views for 2015. As my inner trader surveys the landscape, he continues to see a global uptrend in equities. The Chinese stock market has gone parabolic. 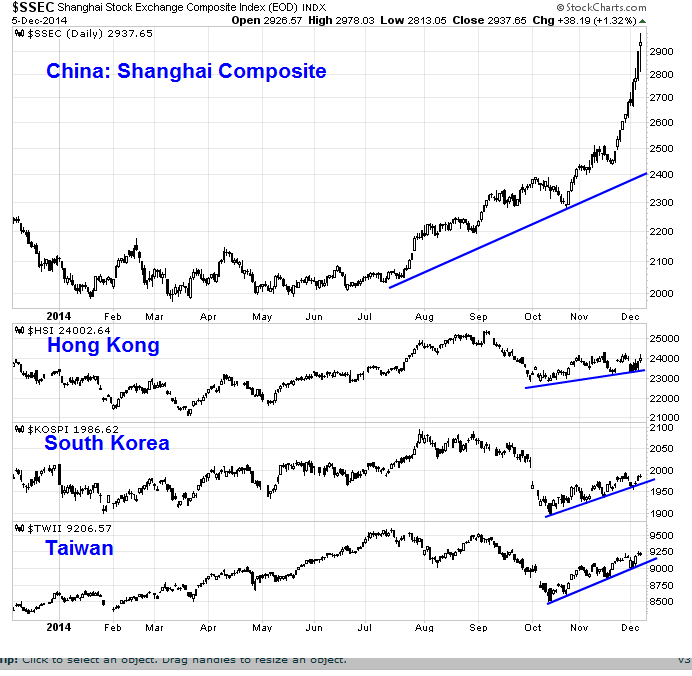 Even though that kind of advance is unlikely to be sustainable at the current pace (see tweet below from Tom Orlik), the other Greater China markets, namely Hong Kong, South Korea and Taiwan, are also in solid uptrends. The picture also looks bullish in Europe. Despite Mario Draghi's heming and hawing last week about whether the ECB is ready to proceed with QE, European markets have been rising and the STOXX 600 is now testing an important resistance level. The advance is supported by confirmation from the 14-day RSI. The German DAX (not shown) staged an upside breakout from resistance last week, which is another positive sign for European stocks. In the US, the SPX tested an intra-day all-time-high on Friday and pulled back from resistance. Unlike the STOXX 600, this index is seeing a negative divergence from RSI-14. Longer term, however, the advance appears to be healthy in the context of a continued uptrend and a recovery from a V-shaped bottom. 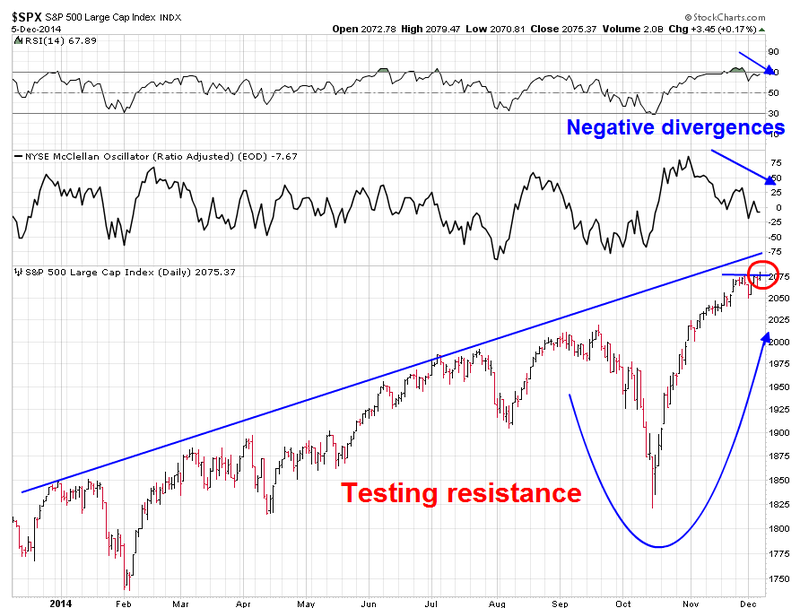 Despite the negative divergence seen in the SPX, I would not be too quick to get overly bearish. 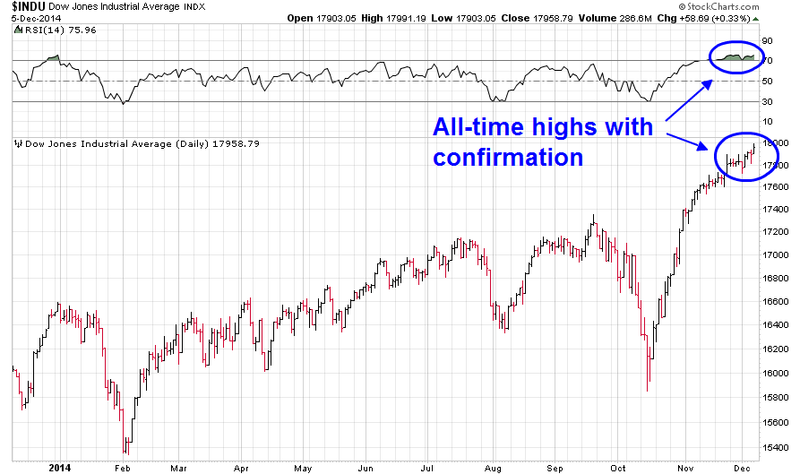 The Dow broke out to an all-time-high on Friday with confirmation from its RSI-14. 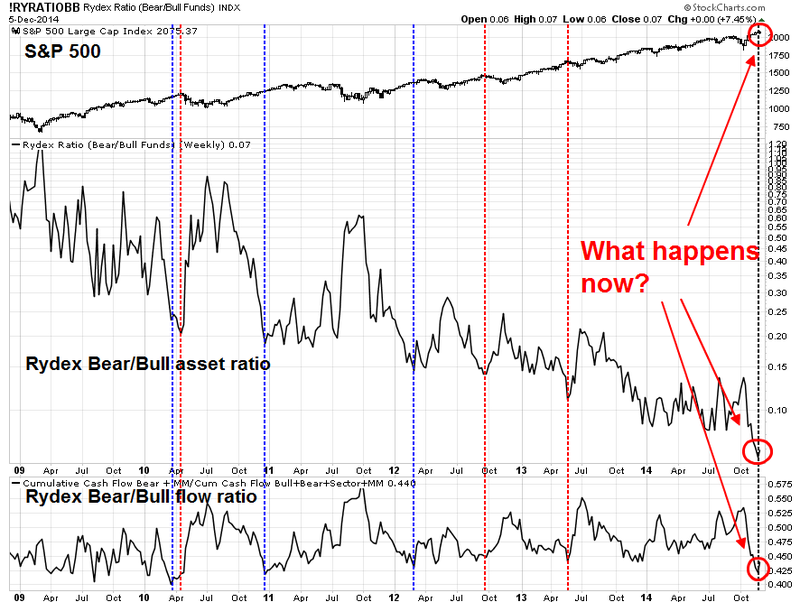 On a more cautionary note, the chart below shows the Rydex Bear-Bull asset ratio (middle panel), as well as the Bear-Bull flow ratio (bottom panel). 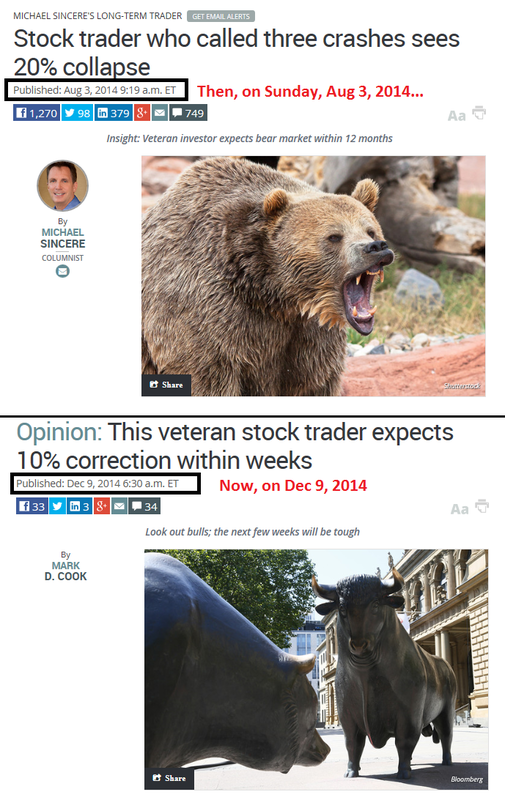 Both ratios are important indicators of investor sentiment. The asset ratio is a barometer of how much bullish and bearish investors have committed to their directional bets, but it could be misleading if viewed in isolation. Imagine that investors committed $X to the bull side and $Y to the bear side; there were no cash flows and the stock market went up by 10% during this period. The bear-bull asset ratio would fall to reflect the increase in stock prices but an observer might see misinterpret this as contrarian bearish because it had fallen 20% (+10% for bulls and -10% for bears). That`s why it`s important to view this in the context of the bear-bull cash flow ratio as well. In the chart, I marked with vertical lines instances the dual conditions where 1) the asset ratio has reached a new low and 2) the flow ratio has also reached a low, indicating possible excessive bullish sentiment among Rydex investors. I further color coded the lines where the blue lines indicate that the stock market continued to advance and the red lines indicated future declines. As the chart shows, we got a signal recently where both the asset and flow ratio reached a crowded long extreme. However, the track record of this indicator shows that it is not perfect and it can have relatively long lags before a decline can begin - this seems to be a characteristic of many sentiment indicators. Another reason for caution is the possibility of some market turbulence ahead from the FOMC meeting due on December 17. 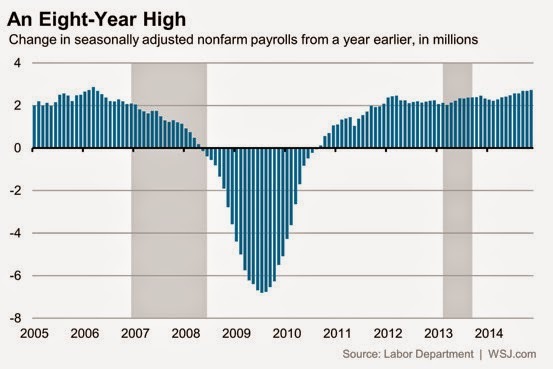 Notwithstanding the blowout surprise from the November Jobs Report, that report made the trend very clear - the economy continues to recover in a manner consistent with Fed expectations. With respect to “how fast” the normalization process will proceed, that depends on two factors—how the economy evolves, and how financial market conditions respond to movements in the federal funds rate target. Financial market conditions mainly include, but are not necessarily limited to, the level of short- and long-term interest rates, credit spreads and availability, equity prices and the foreign exchange value of the dollar. When the FOMC adjusts its short-term federal funds rate target, this does not directly influence the economy since little economic activity is linked to the federal funds rate. Instead, monetary policy affects the economy as the current change in short-term interest rates and expectations about future monetary policy changes influence financial market conditions more broadly. First, when lift-off occurs, the pace of monetary policy normalization will depend, in part, on how financial market conditions react to the initial and subsequent tightening moves. If the reaction is relatively large—think of the response of financial market conditions during the so-called “taper tantrum” during the spring and summer of 2013—then this would likely prompt a slower and more cautious approach. 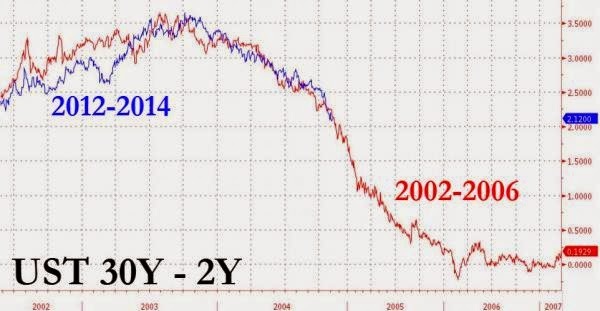 In contrast, if the reaction were relatively small or even in the wrong direction, with financial market conditions easing—think of the response of long-term bond yields and the equity market as the asset purchase program was gradually phased out over the past year—then this would imply a more aggressive approach. The key point is this: We will pursue the monetary policy stance that best generates the set of financial market conditions most consistent with achievement of the FOMC’s dual mandate objectives. This depends both on how financial market conditions respond to the Fed’s policy actions and on how the real economy responds to the changes in financial conditions. Dudley, along with vice-chair Stanley Fischer and chair Janet Yellen, represent the inner circle of Federal Reserve decision making. This was an extraordinarily hawkish speech by a member of that group. At the very least, expect the "considerable time" phrase to be replaced by a statement that the market consider to be hawkish in tone and therefore stock market bearish. 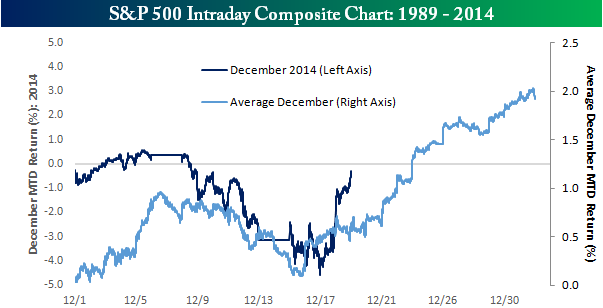 I would expect that stock market bulls may not find the December FOMC statement too friendly. My inner trader interprets current market conditions as a possible pause in a market uptrend. The global uptrend in equities cannot be ignored and he is giving the bull case the benefit of the doubt. On the other hand, the combination of negative divergences and sentiment models do indicate that caution may be warranted. As well, traders should also remember that investors often engage in tax loss selling this time of year. My base case scenario therefore calls for either a slow grind up in stock prices or a sideways consolidation for the first half of December, with a seasonal rally to begin in the latter half of the month. Charlie Bilello at Pension Partners created a chart that described this pattern well and it seems to be a reasonable roadmap to use. Tactically, current conditions suggest approaching the market as a market of stocks, rather than a monolithic stock market. It suggests either remaining modestly long, or using a long-short strategy of emphasizing market leaders, which reflect the optimism of a growing economy, on the long side while either avoiding or shorting laggards, which could be vulnerable to tax-loss selling. The chart below shows the relative performance of a number of market leaders relative to the SPX. 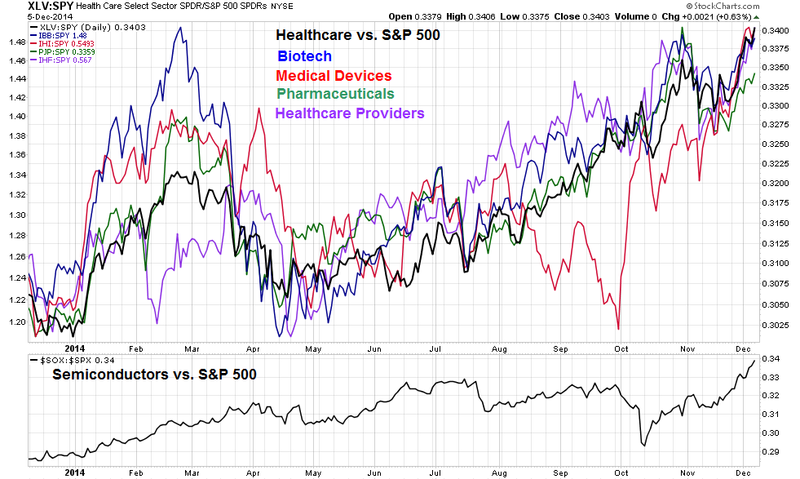 The top panel shows the Healthcare sector and its component industries, which have all outperformed the market for much of the year, and the semiconductor stocks on the bottom panel. 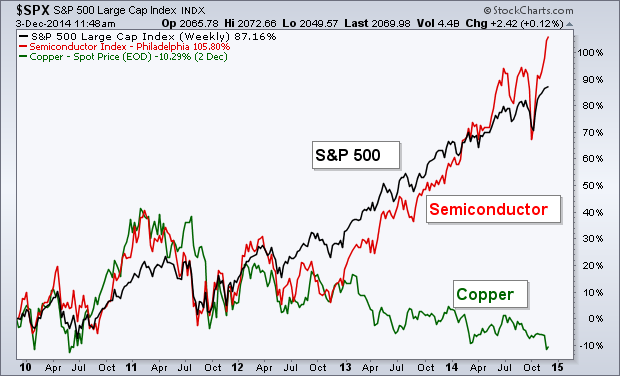 Speaking of semiconductors, I would also like to mention the post from Andrew Thrasher who believes that semiconductors has replaced Dr. Copper as a leading barometer of the global economy. In that context, the emergence of semiconductor stocks as a leadership group should be regarded as intermediate term bullish. As for the laggards, small cap stocks have been roughly flat for the entire year and underperformed the SPX more or less all year. This pattern is suggestive of continued small cap underperformance for the next couple of weeks, followed by a typical seasonal small stock rally into January. Resource stocks are also the most likely candidates for tax-loss selling in December. The top panel of the chart below shows the absolute performance of the Energy sector as well as the Metals and Mining stocks. 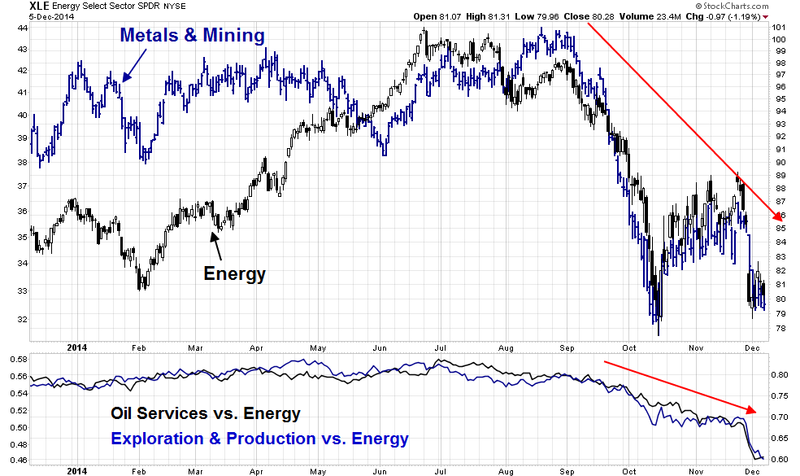 The bottom panel shows the relative performance of the oil service and exploration and production groups relative to the already disappointing Energy sector. The Energy sector averages are dominated by the integrated oils like ExxonMobil and Chevron, whose profitability are cushioned by their downstream refining and marketing operations. The oil service and exploration and production companies have no such protection. They are more vulnerable to oil price weakness and therefore further weakness from tax loss selling. As the year draws to an end, I would expect that these weak sectors and groups, such as small caps, energy and mining stocks, to weaken and then stage a snapback rally in the last week of the year. My inner trader is watching market conditions and preparing for such a possibility. In the meantime, he is nervously long with relatively tight stops. Next week, I will discuss how my inner investor views the challenges and opportunities for equities in 2015. 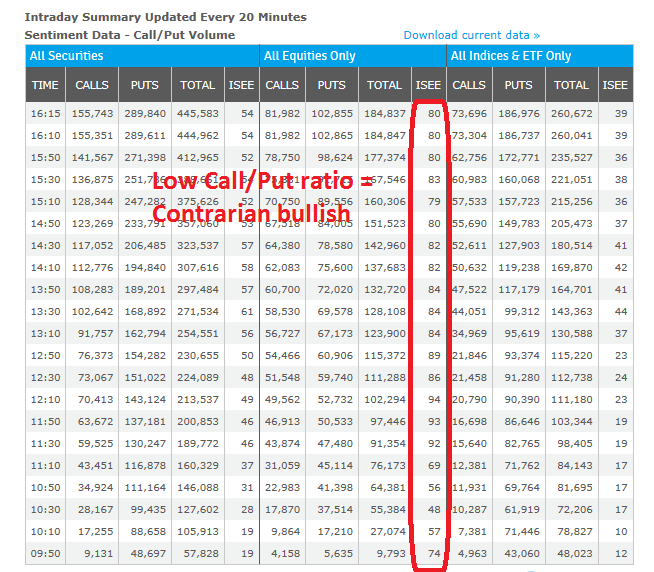 Is the put/call ratio be a contrarian indicator?